A tell tale is a structure that hangs something (often rope) over the tracks so as to physically warn personnell on top of railroad equipment of imminent danger from impaired vertical clearance. The tell tales were intended to prevent the classic scene of the coyote swept off the top of the train by the tunnel portal such as in a Roadrunner cartoon by brushing a roof-top rider with dangling ropes. They were set some standard distance (200 feet?) from obstructions such as bridges and tunnels, and utilized a timber or steel frame (sometimes boiler tubes) to support the hanging ropes. They were completely obsolete when regulations prohibited railroaders from the roofs of equipment. Previously, brakemen had traveled along the roofwalks to set retainers and even brakes either as a part of switching operations or before the advent of automatic brakes. A set still stands at the north end of the Hauto Tunnel on the L&NE in Hauto, PA.. That would make two L&NE sets still in existence, as at least the post for a set also stands on the R.O.W. in East Penn Twp./West Bowmans, PA. I seem to recall some surviving on the N&W Clinch Valley line, but I can't recall the specific locations off the top of my head. This picture was taken today in Seattle, WA. 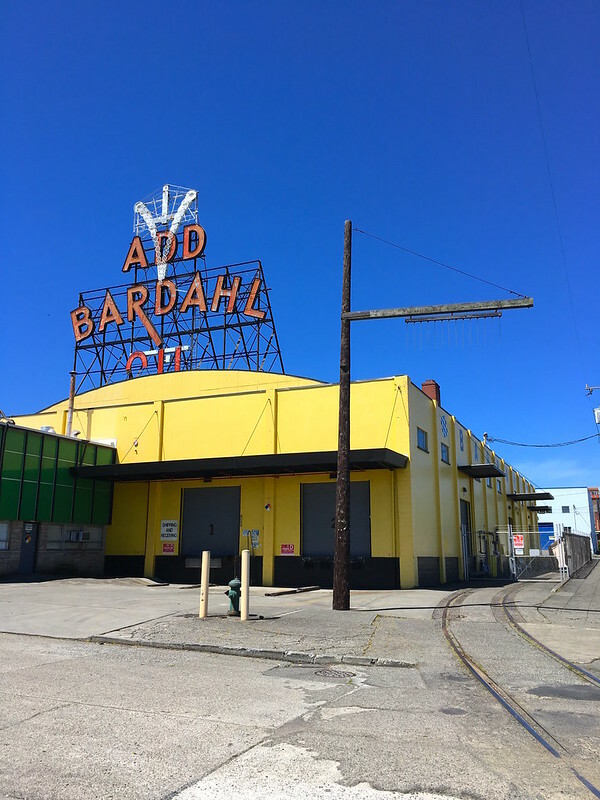 The Bardahl Plant still has its Tell-Tale, even though the siding is no longer in service. At the risk of being boo'ed off the forum for apostasy, there is still a telltale located just west of tunnel no. 1 on the famous Sparta-to-Elroy, WI bike trail. This right of way was abandoned by the C&NW back in the 1960's and became the FIRST rails-to-trails project in the country. It is an interesting line, 32 miles long, with three tunnels ranging from 1/4 mile to 3/4 mile in length and grades in excess of 2%. A great place to visit whether you are a railfan or a cyclist! There's one about an 1/8th of a mile north of the current end of track on the Naugatuck Railroad in Torrington, CT. It stands on the remains of the coal dump siding for the defunct Torrington Company. Thanks to Chris Salmonson for renewing this 7 year old thread, and to Hamster and Randy for new info. Seems that most surviving Tell-Tales (IF still around) are remnants of "the old days". Not much formal preservation if I read the thread correctly, except for Niles Canyon's replication at the Farwell Bridge. Hopefully, more museums might consider adding a Tell-Tale, either an authentic specimen (preferred) or a replicated copy, in the future. A good way to explain to visitors of how brakemen "rode the tops of the cars" in the past, and its corresponding dangers. There are at least 3 on the B&M Hillsborough Branch in and around Nashua NH on the current Pan Am. There was one for the Hazle (or Main) street bridge in Wilkes Barre PA over one of the CNJ branches. I remember it there 10 yrs ago, not sure if it still is. I forget if there were others in town still extant. There is one at each end of the bridge over the St.Croix river near Osceola. The one on the West end remains over the track, the one on the east end has been swung out of the way.